Ranked as one of the very best rums to come out of South America, this dark hued Venezuelan Rum is beloved by connoisseurs and casual drinkers alike. Set deep in the Venezuelan countryside, the distillery is surrounded by the beautiful National Park Terepaima, a location befitting of their marvellous spirit. Diplomatico is a brand of rum made by Destileria Unidias (a 100% Venezuelan owned company), who run one of the most complex and varied distilling operations anywhere in the world. The distillery has seven stills, three potstills and four column stills, allowing it to create a versatile and wide range of spirits. They use only the very finest grade of molasses. Destileria Unidias have an unbelievable 49 different recipes for rum that the use at their site, allowing them to produce both Cacique rum, which sells over a million cases in Spain alone, and Pampero, known to many bartenders across the UK and Europe as a top-quality cocktail rum. 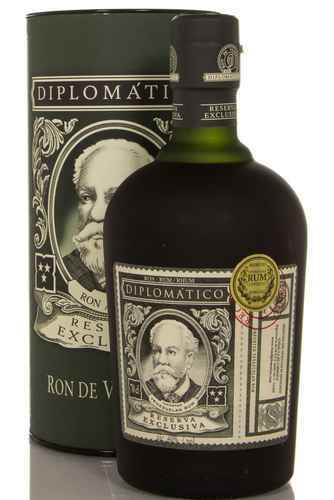 Yet it is Diplomatico that is their stand out premium rum, and it has rightly won many plaudits. The story of the brand’s name is a charming one. During the latter part of the 19th Century, a distinguished gentleman named Don Juancho Nieto Melendez, who lived close to where the distillery is now based, developed a passion for sourcing and understanding the very best beverages and spirits he could. Particularly, Melendez was fascinated by artisan techniques that produced different flavours by just the slightest variation. Bringing with him to Venezuela a knowledge of sugar mills and distillation techniques, alongside a selection of the very finest liquors he encountered in his Caribbean tours. 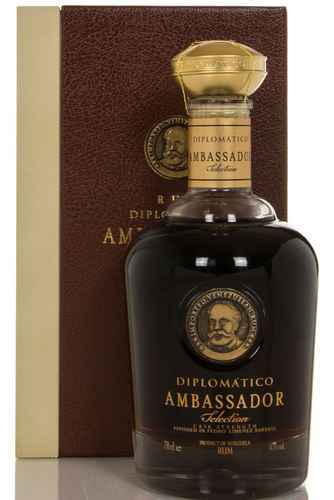 With these he created his own blends that were offered to his friends at dinner parties, that became known as ‘The Ambassador’s Reserves’- hence, ‘Diplomatico’! In addition, all bottles of this rum feature his portrait. Seagram’s first founded the distillery in 1959, settling on the location of La Miel for a number of reasons. Firstly, it provided a local workforce, but it was lay in close proximity to five sugar processing plants, three of which supply four fifths of the distillery’s Molasses. Secondly, there is a copious supply of extremely pure water in the area, which fills the distillery’s five very deep 100 metre wells. The water is so pure and free from mineral content that the distillery uses it directly in their distillation without any additional processing or filtration. As it is in the mountains and rainforest, the temperature changes greatly across day and night. Furthermore, the location maintains a high humidity, and these two features allow for the successful growth of sugar cane, and a heightened maturation period for the rums once in the cask. Destileria Unidias uses the very best sugar cane honey and molasses to make their rums, with molasses being used for their lighter rum and sugar cane honey for their richer, heavier rum. They seek out the molasses with the very highest sugar content, of around 50%, whilst their sugar cane honey often reaches around 60 percent sugar content. The distillery has storage facilities for a huge 16,000 metric tonnes of molasses in underground tanks. Destileria Unidias has a highly unique fermentation style. The distillery maintains and grows its own yeast strain, first created during the Seagram’s ownership. A slight amount of this is used to kickstart fermentation in an incubator, into which diluted molasses and oxygen are added. Shortly before this process, the molasses are weighed in gigantic Romana vats which are suspended on scales, with over 24 tonnes of molasses being used in a batch. The yeast quickly multiples, and more molasses are added until it can be moved to a larger tank, working much the same way a “sourdough starter” does. This starter is then used in one of the distillery’s huge 100,000 litre fermentation tanks, made of stainless steel. The distillery ferments at 30-32 degrees Celsius. Destileria Unidias uses shorter fermentations for their lighter rums, running a 24 hour ferment with 28 tonnes of molasses, producing a high percentage of alcohol. Their heavier rums, on the other hand, are fermented for 48 hours from a smaller, 24 tonne batch of sugar cane honey, maximising the character and flavour of the eventual rum. Interestingly, the distillery removes the yeast from their light rum “wort” using a centrifuge, which is then used to kickstart the next fermentation (somewhat like a sourmash in bourbon production). For heavy rums though, they do not remove the yeast, leaving it in the distillation, to add further character. Destileria Unidias distils both their heavy and light rums in column stills for their primary distillation, using different columns for the different category of rum. The distillery prides itself on sufficiency and a waste-free process, thus the excess fluids from distilling are used as a fertiliser on their sugar fields. Heavy rums have their secondary distillation in copper pot stills with a wiggly lyne arm that means that distillate is returned to the still in a partial triple distillation process. They also include retort chambers that contain distillate from the last distillation, which creates a higher final alcohol strength. Destileria Unidias takes their cut at 15 minutes, at around 92% ABV, the heads and tails are discarded. Semi-heavy rums are distilled in a giant cylindrical copper pot, known as a batch kettle. This can contain up to 40,000 litres of wash, and is heated internal pipes, powered by steam. It produces a spirit of 96.4% ABV. Meanwhile, light rums have their second distillation in computer run Coffey stills, in the most modern part of the distillery. Interestingly, these copper stills are split, with one half being stainless steel and the other being copper. This produces a spirit of a strength matching that from the batch kettle, though of a totally alternate style. The distillery also produces a range of gins, vodkas, liqueurs and whiskies, made from different cereals including wheat, barley and rice. Destileria Unidias barrels their heavier rums at 50%, notably low, whilst their slightly lighter rums are casked at a still low 55%, and their lightest rums are barrelled at 65%- closer to the industry standard. Mostly, maturation occurs in bourbon barrels, and occasionally in malt whisky casks, though recently some port and sherry barrels have been used. Heavier rums are matured for long periods, usually between 4-12 years, but sometimes longer. These are placed in the coolest part of the warehouse, whilst lighter rums are only matured for 2 years and placed in the hotter parts. As the Venezuelan rainforest is so hot, Destileria Unidias experiences a greater percentage loss to angel share, losing about 7-8% annually. Luckily, water evaporates at a rate nearly matching the alcoholic loss, so proof pretty much stays the same. Unlike many other South American distillers, which operate a Solera system, once the distillery has filled a cask and placed it in the warehouse it is left untouched and unopened until it reaches the right age. As of 2015, the distillery had 21 warehouses, containing over a quarter of a million casks. Diplomatico Rums undergo a specialised filtration system to ensure a creamy mouthfeel. All rums must be approved by a rigorous tasting panel and scientific laboratory. The rums are diluted with water drawn freshly from their wells. The process is overseen by only the third master distiller and blender to work at the distillery, Tito Cordero, who has been in place since 1988, when he took the job after moving to the area to follow his wife. As much as their excellent rums, the Diplomatico brand is known for their extremely passionate and friendly owners, the Ballesteros family, who tirelessly travel the world promoting their wonderful spirit. Drinkers of Diplomatico should expect a jammy and rich toffee-led rum with a gentle, creamy mouthfeel and a slight salinity. These rums are a keep part of ever serious rum-drinkers collection, and a unique product from one of the world’s very finest distilleries.